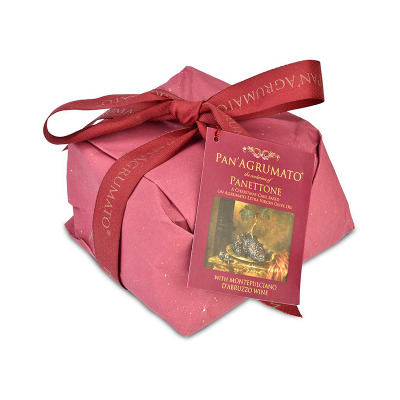 A unique Panettone, with a new but extraordinary taste, suitable to satisfy those who want to surprise with delightful novelties. Without butter, replaced with extra virgin olive oil of its own production and with a cream obtained from the Montepulciano d’Abruzzo wine. High digestibility, lactose and milk derivatives free, low fat and really low cholesterol. Pan' di Uva with E.V.O.O. and Montepulciano d'Abruzzo Wine is realized substituting the butter with the Agrumato Extra Virgin Oils. This is a very original dessert, delicious and soft with an inimitable taste. INGREDIENTS: WHEAT flour, wine Montepulciano filling 18%, (Montepulciano wine 30%, water, glucose syrup, sugar, thickeners: pectin and sodium alginate, maltitol powder, alcohol, preservative: acid sorbic) raisins, EGGS, natural yeast (WHEAT), extra virgin olive oil 7%, sugar, glucose syrup, emulsifiers: mono and diglycerides of fatty acids of vegetable origin, EGG yolk, OAT fiber, salt, natural flavourings. DOES NOT CONTAIN PALM OIL. ALLERGENIC ADDITIVES - CONTAINS: wheat flour (gluten), natural yeast (gluten), egg yolk (eggs), eggs, oat fiber (gluten), May contain traces of ALMONDS, HAZELNUTS, PISTACHIOS and SOYA.